Elevate your footwear staples with our range of wide fit calf boots. Available in EEE fit, our boots are designed with elasticated panels around the calves to provide extra stretch for an easy all-day fit. Browse the rainge to find your perfect look in UK sizes 4 to 10. Update your footwear collection with our range of wide calf boots. Combining comfort and style, finding the perfect shoe has never been easier with a selection of cushioned sole designs that offer a roomy, more relaxed fit. From this season’s latest trends to timeless staples that you can turn to season after season, find your perfect pair in sizes 4 to 10. Round off your desk-to-dinner line up with a pair of wide calf leather boots. From classic wide legged boots, featuring elasticated panels in a typical riding design to tasselled styles that nod to this season’s boho trend, find your perfect pair in E or EEE fit. Opt for flat sole styles for day-to-day activities, or a slight block heel to elongate your legs at more formal events. Finish the look with a knee long skirt and a tucked in blouse for a smart go-to profile. 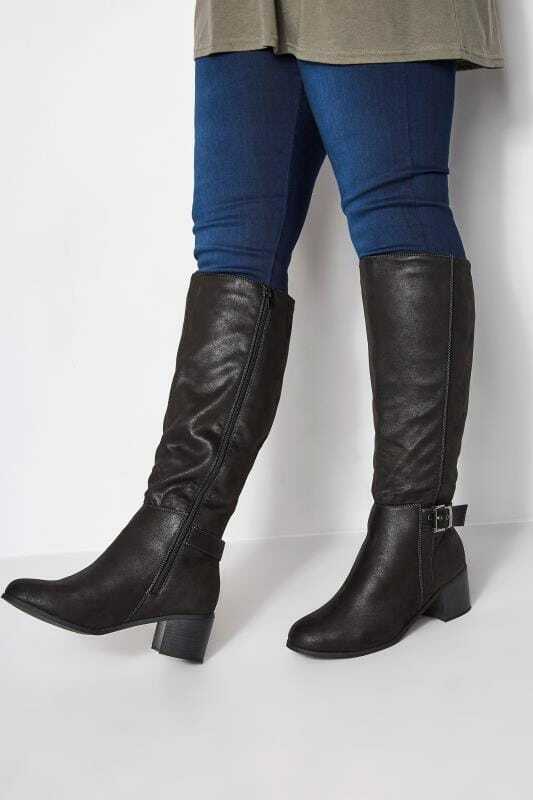 Stay on-trend with a pair of boots for wide calves. Ideal for weekend wear, long walks and Sunday brunches, our range of extra wide fit calf boots are your ultimate go-to this season. Team with light-washed denim and a fine knit jumper for a low-key look, or dress them up with ripped jeans and an off-the-shoulder top.